Google Keep is now part of Google's G Suite and will appear as a side-bar on Google Docs. 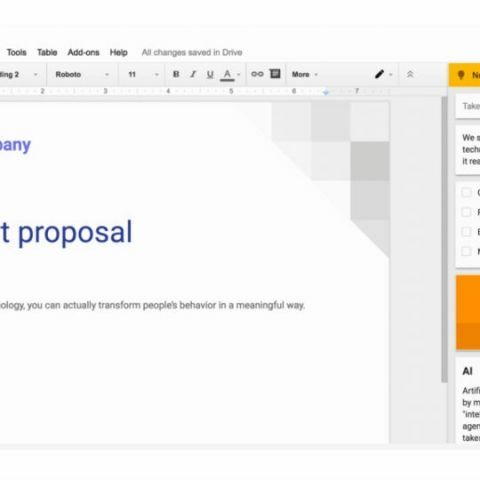 Google, today, integrated two of its premiere apps - Google Docs and Google Keep. The integration brings Keep within Docs, putting it beside each document that you create. With this, Keep becomes a part of Google’s G Suite apps, allowing users to transfer content to and from the app, while working on Google Docs. With the new integration, Google Keep will appear as a side-panel on your documents, allowing you to drag and drop content from the app to the documents. The formatting you selected in either side will be preserved after moving to the other. So, if you have a checklist on Keep, you’ll have a bulleted list on Docs, and vice-versa. Of course, Google’s search functionality also resides within Keep. So, those who keep a lot of notes etc. on Keeps will now be able to search through them. The apps seem to be integrated only on the web right now, although Google’s blog post says it’ll be available on Android, Chrome, iOS and the Web. As with all new features, this one will also be a phased rollout, which means it may be a few days before you see it. When you do get it, the Keep integration can be accessed from the Tools menu on Google Docs.